Specifying the molecular weight of the target compound in the Sample Log-in screen enables easy identification of the target compound in the Data Browser. Once data acquisition is completed, the software automatically sends an e-mail containing a URL to a quantitative results report in the Data Browser, allowing chemists to check their results remotely. The user has full functionality - even adding or deleting a peak of a LC or PDA chromatogram. A built-in software function allows a user to automatically wash the flow line after each sample analysis, even when using multiple LC columns, to prevent damage to or contamination of the LC column. An additional feature makes it possible to set a specific timeframe or day of the week to start up the system in preparation for analysis. After log-in, submit a sample and perform analysis on the same screen as sample registration. After the data acquisition is finished, the software automatically sends an e-mail with a URL to the quantitative results report. The progress of the analysis and queue time is shown in the Sample Log-in window for easy verification of system status. Review results remotely by clicking the link in the automatically generated e-mail to open the Data Browser. The user has full functionality - even adding or deleting a peak of a LC or PDA chromatogram is possible. * Free software provided by Microsoft® should be installed. The chromatogram peak is highlighted in green when the target compound is found. 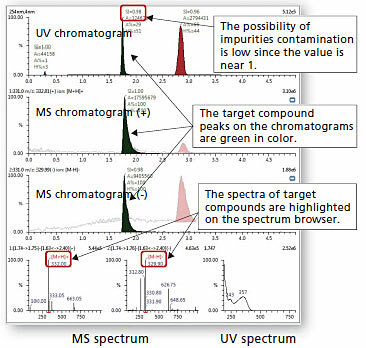 The MS spectrum in the peak is processed and the index of the spectral integrity is shown in the peak annotation. Peaks may be easily added to or deleted from the LC/PDA chromatogram, which can be magnified, in the browser window. 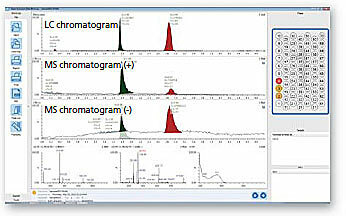 Processing can be performed via simple mouse commands, allowing users remote access to basic chromatographic analysis.